Dimension NXG, which has created India’s first augmented reality headset AjnaLens and the software technology behind it, has raised an undisclosed amount in angel investment from a group of investors including Paytm founder Vijay Shekar Sharma, one of the startup’s co-founders told VCCircle. Other investors included Japan Vyas, co-founder and managing partner at Sixth Sense Ventures and an early investor in Paytm; Nailesh Khimji, owner of Khimji Ramdas Group, Oman; and Chetan Kajaria, joint managing director at Kajaria Ceramics, Abhishek Tomar, chief technology officer at the venture, said. AjnaLens offers a virtual computer vision solution embedded in real environments through holographic display technologies. Venturing into a nascent but fast-evolving space largely ruled by a handful of global firms such as Microsoft HoloLens, Magic Leap, and Meta, AjnaLens creates high-resolution three-dimensional computer holographic visuals that float mid-air. Users can experience and interact with the holograms using the firm’s hardware product, the headset. Users can navigate around the holograms as if they were actual objects through air tap gestures and voice commands. Dimension NXG was originated out of a Google Startup Weekend session at IIT Bombay where three of its co-founders— Abhijit Patil, Pankaj Raut, and Gaurav Godbole—met. 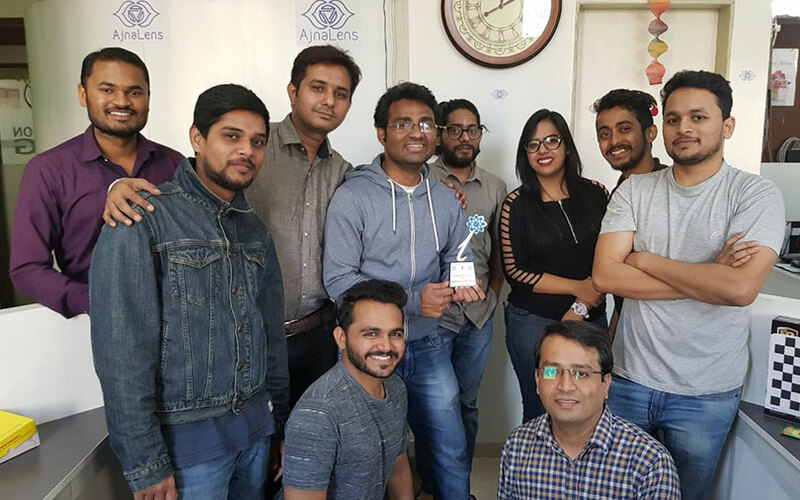 They created a 3D computer vision solution and bagged the first price. Following this, the team was joined by Tomar and they set up operations in early 2015. They then began working on IP development and software algorithms to create a computer vision solution to address tracking, reconstruction and spatial mapping. The experiment eventually led to augmented reality and thus AjnaLens. “The extension of our early software algorithm was about effectively implementing the product, besides exploring opportunities to create a global positioning with the product, given that we have successfully created a world-class technology. That's when we decided to move on to the next phase of innovation and decided to create an augmented reality product," Tomar said. Over the course of three years, the team has developed patented hardware and software for its AR headset. While most companies in the VR and AR domain focus on the software, Dimension NXG took an integrated approach to create its own hardware and deployed its software based on 3D scanning, artificial intelligence, machine learning, computer vision, and spatial perception. This allows users to interact with AR objects using hand gestures, voice commands and gaze controls. The product, a mix of software and hardware, enables AR objects to blend with the environment by using ambient and realistic shades to get quality holograms. The device’s world sensing technology can integrate digital holograms seamlessly with the environment to give an immersive experience. The device can scan the environment in real time using depth sense technology, which in turn can create a 3D map of the environment and can measure AR elements accordingly to deliver a realistic experience, the company claims. According to Tomar, the headset has a see-through lens with 90-degree field of view and he claimed that the device is poised to achieve 100-degree field of view shortly. "There's no one in the market who would give you 100-degree field of view. We have already crossed 90-degree in the prototype. The opaqueness or the occluded quality of holograph is much better in AjnaLens than any other product in the market. The AI, special perceptions factor and deep learning is a huge focus for us. AjnaLens is lightweight and is available at half the cost of available solutions in the market," Tomar explained. A practical enterprise-only application, AjnaLens targets businesses involved in manufacturing (automobile, heavy machinery, aerospace); construction (institutional, commercial and residential); designing (architectural design, product design); medical (pre-planning of surgeries, medical education); and defence (training and territorial exploration). The product, yet to be officially unveiled, already has two clients from the US (one of them an existing Microsoft HoloLens user), and one from India. The company plans to officially launch the product in April and has a 100-piece commitment from one of its clients. Owned and operated by Dimension NXG Private Limited, the startup is already in talks with institutional investors for its next round of investment and is planning to set up a development centre in Bangalore and a marketing unit in the US. "From the tech front, the focus for our next phase of growth is to reduce the form factor and make it more competitive by bringing in more deep learning capabilities. From a business perspective, we want to capture a good percentage of the market share," Tomar said.